Meet The Ladies: a flock of smart, affectionate, highly individualistic chickens, who visit their favorite neighbors, devise different ways of coping with predators, and mob the author like she’s a rock star. In these pages you’ll also meet Maya and Zuni, two orphaned baby hummingbirds who hatched from eggs the size of Navy beans. Little more than air bubbles fringed with feathers, their lives hang precariously in the balance—but with human help, they may one day conquer the sky. 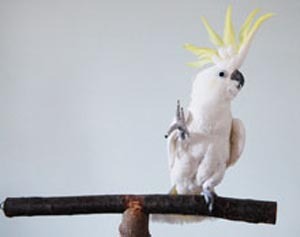 You’ll also meet Snowball, a cockatoo whose dance video went viral on YouTube and who’s now teaching schoolchildren how to dance, as well as Harris hawks Fire and Smoke—and a host of other avian characters who will change your mind forever about who birds really are. Each of these birds shows a different and utterly surprisingly aspect of what makes a bird a bird—and these are the lessons of Birdology: that birds are far stranger, more wondrous, and at the same time more like us than we might have dared to imagine. 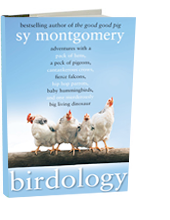 In Birdology, beloved author of The Good Good Pig Sy Montgomery explores the essence of the otherworldly creatures we see every day. By way of her adventures with seven birds—wild, tame, exotic and common—she weaves new scientific insights and narrative to reveal seven kernels of bird wisdom. The first lesson of Birdology is that, no matter how common they are, Birds Are Individuals, as each of Montgomery’s distinctive Ladies clearly show. Another thing you must know about birds is that Birds Are Dinosaurs: in the leech-infested rainforest of Queensland, you’ll come face to face with a Cassowary—a 150-pound, man-tall, flightless bird with a helmet of bone on its head and a slashing razor-like toenail with which it (occasionally) eviscerates people. You also need to understand that Birds Are Made of Air, as Montgomery assists a wildlife rehabilitator who rescues, raises, and releases orphaned baby hummingbirds. To probe birds’ astonishing navigational abilities, Montgomery attends pigeon races; to understand their wildness and how they hunt, she flies falcons; to experience birds’ ubiquity, she visits a crow roost of 50,000 birds that has moved into—and some say taken over—a small city’s downtown. And to witness birds’ immense intelligence, she visits birds who talk and she dances with Snowball the cockatoo. Birdology explains just how very ‘other’ birds are: Their hearts look like those of crocodiles. They are covered with modified scales, which are called feathers. Their bones are hollow. Their bodies are permeated with extensive air sacs. They have no hands. They give birth to eggs. Yet despite birds and humans’ disparate evolutionary paths, we share emotional and intellectual abilities that allow us to communicate and even form deep bonds. When we begin to comprehend who birds really are, we deepen our capacity to approach, understand, and love these otherworldly creatures. And this, ultimately, is the priceless lesson of Birdology: it communicates a heartfelt fascination and awe for birds and restores our connection to these complex, mysterious fellow creatures. Birds have been trying to educate me since I was a child. I have always loved watching and reading about and learning from them. 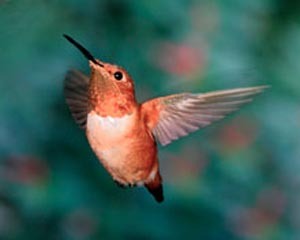 But even more importantly, birds always come into my life at critical moments to enrich my spirit and enlarge my heart. The first male ever to court me —I was only a child but I loved him deeply—was a bird. I was seven. His name was Jerry. He was a green parakeet who came home with me from a dime store. And although I was delighted when he first agreed to perch on my hand and thrilled when he would finally fly to me, I was most honored when he threw up on my finger. Even though I had never seen any other creature do this in quite the same way, I understood what was happening: he was feeding me. This was a mark of deep trust and affection, and he would do this with only me. He had taken me as his mate.